i) By adjusting the specimen position. The Eucentric height defines the optimized specimen location based on the magnetic field. ii) By adjusting the strength of the lens in the microscope. In TEM operation, before doing any adjustments and alignments on the microscope, the current of the objective lens should be set to its “Standard Focus” value for high resolution work. This standard focus value is defined by the microscope manufacturer. That means focusing process has to be primarily performed with mechanical adjustment of the Z-height of the specimen, which is also called “adjustment of the Z-height to standard focus” or “rough focusing”. Note that with some specific commands, some microscopes can store the users’ “Standard Focus” value depending on the magnification range. ii) The magnification calibration. On most microscopes, one gets the best calibration data by calibrating at the highest magnification, and then works down the range because of inherent hysteresis in the electromagnetic lenses. i) and ii) above can be corrected by pressing the STANDARD FOCUS bottom a number of times during the operation. In this way, the applied current is essentially returned to zero a number of times. This reduces lenses to the standard level of magnetization. iii) Re-perform i) and ii) when the observing area is changed and the specimen is tilted. If the specimen is tilted, the change of the observing location will change its height. For instance, the first observing area marked in orange in Figure 2778 (a) was at Eucentric height, however, once the observing area is changed to the one marked in red in Figure 2778 (b) it is not at Eucentric height anymore and thus the Z-height needs to be re-adjusted. Figure 2778. Change of Z-height in a tilted specimen: (a) The observing area marked in orange is at Eucentric height, and (b) the observing area marked in red is not at Eucentric height. Furthermore, the dimension measurements, e.g. 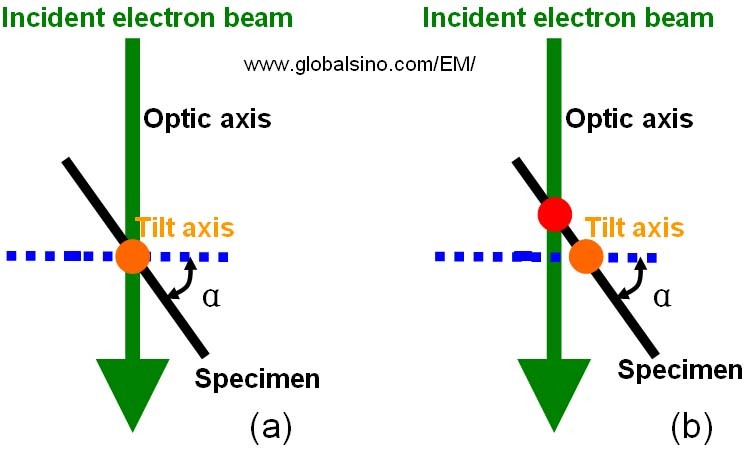 evaluations of critical dimension (CD) and d spacings, in TEM cannot be accurate (normally 10% ~ 100% inaccuracy) if the camera length is in error. To ensure that the installation-calibrated camera length can be used in your experimental measurement, the specimen should be positioned in the "Eucentric plane". This can be done simply by manually tilting the specimen and thus finding the height of the specimen holder where the image of the specimen remains stationary.